These small key-shaped die cut porcelain signs measure 9″ by 4″ each. The signs are white, navy blue, and a golden yellow. 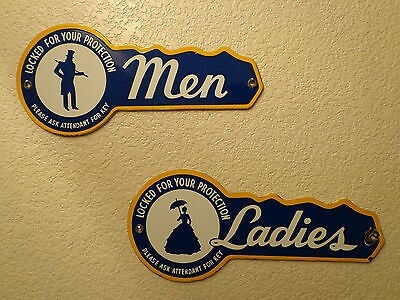 The Men’s restroom sign has a gentleman illustrated, while the Ladies restroom sign has a ladie illustrated.